Over the past years, research on academic writing has considerably contributed to the description of scientific prose in the age of mass literacy. The academic written register, for instance, has been described as one exhibiting an increased use of ‘economy’ linguistic features that enhance informational density and create an agile, efficient and concise style (Biber and Gray, 2016; Hyland and Jiang, 2018). Science popularization writing, however, has been comparatively under-researched in regards to linguistic description, possibly because we do not fully know whether new web-mediated forms for science dissemination are actually impacting scientists’ literacy practices, or whether new science popularization genres really involve new rhetorical exigencies. To contribute to fill this gap, this paper reports on the results of a survey that aimed to map scientists’ writing practices in the context of increased digitization in contemporary research communication. The specific aims of the survey were, firstly, to gain insight into web-mediated scientific knowledge dissemination and, secondly, understand how the affordances of new forms for communicating science on the web determine, or rather, constrain both language structure and style choice. We describe the respondents’ particular approaches to knowledge dissemination (e.g. knowing how to state achievements, making the text appealing, persuading readers of the significance and validity of the research, and using language accurately and appropriately according to the target audience(s)). We also specifically discuss the respondents’ interest in multimodal genres and other forms of generic innovation, as well as their reliance on verbal and visual resources to disseminate their research work online. Supporting the view that literacies are multiple, overlapping, and diverse (Barton, 2007: 37), the findings can contribute to a better understanding of the complementarity of academic and digital literacy skills development. While there is little dispute in the literature that writing in English for Research Publication Purposes (ERPP heretofore) entails an ‘additional effort’ to non-native English speaking academics, the issue of ‘acceptability’ of English (e.g. 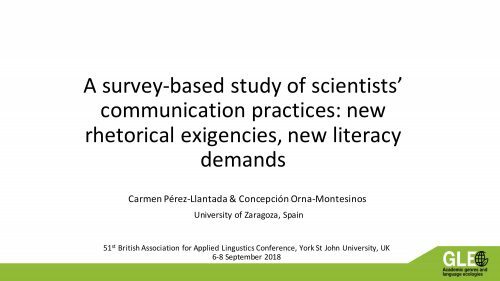 non-canonical grammar features and language traits of academic writing cultures and rhetorical traditions)in the texts published in English by non-Anglophone academics is gaining momentum (e.g. Rozycki and Johnson, 2013; Hynninen & Kuteeva, 2017). Drawing on data from an online survey and semi-structured interviews with academics (n=40), we map the repertoire of research genres deployed by these academics in their workplace and report on the strategies and resources that they rely on when writing in ERPP. 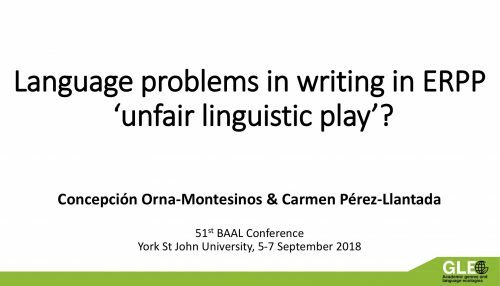 We also assess what they perceive as the most problematic language aspects they face in the writing process, which turn out to not to be dissimilar to those faced by other cohorts of non-Anglophone academics (e.g. Duszak and Lewkowicz, 2008; Lillis and Curry, 2010). As the interviewees explicitly referred to the ‘foreignness’ of their L2 English texts as the major impediment for getting their texts accepted for publication, we specifically focus on their comments onthe ‘quality’ of English in their own writing and their perceptionsof the language-brokers’ feedback.Given that language problems were systematically associated to the pressure to publish in English-medium publications, we finally provide some pedagogical proposals to support non-Anglophone academics’ writing skills development and, at the same time, raise their awareness thatgood use of English language resources does not necessarily mean conformity to the Anglophone norms.